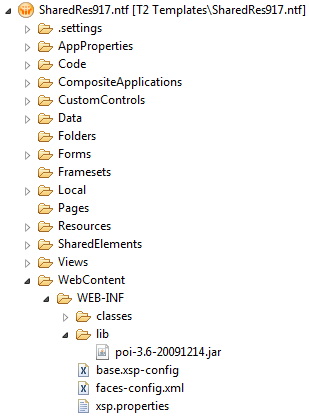 I’ve written a piece before on roles in XPages, but since that dealt with using the ACL to limit access to a page and not about the programmatic use of roles, I wanted to return to the issue. Now, I’m not sure what impact of referencing the user roles that way has on performance, but since I now I’m using them in many rendered formulas all over my application, I decided to compute it once and then reuse it many times. I put a few extra lines into a control that’s on my main application layout control to drop it into a sessionscope variable. I suppose I might shave a millisecond off if I only computed that once per session, but I didn’t go that far. Note that the debugging uses Mark Leusink‘s DebugToolbar, which I highly recommend to everyone. Yesterday, I posted about exporting to Excel without having Excel on the destination device, which I found particularly useful when using my Android tablet and the Chrome browser. It was a relatively long post, necessitating a two-part post. Before we delve into the code, lets first examine what we’re passing to the function. Each of these values is acquired either from the XPage or from the report configuration. Using these, we have a lot of flexibility to create and format our spreadsheet. workbookName: From the XPage, which defaults the value to the report name selected. It will be used as the filename for our spreadsheet. sheetName: Also from the XPage, defaulting to ‘Report’, but editable by the user to place as the worksheet name for the single worksheet of our spreadsheet. fieldList: From the report configuration. This is a list of the field names, in order, to be used as values in the columns. This implementation uses field values instead of column values, but it could easily be modified to use those instead. 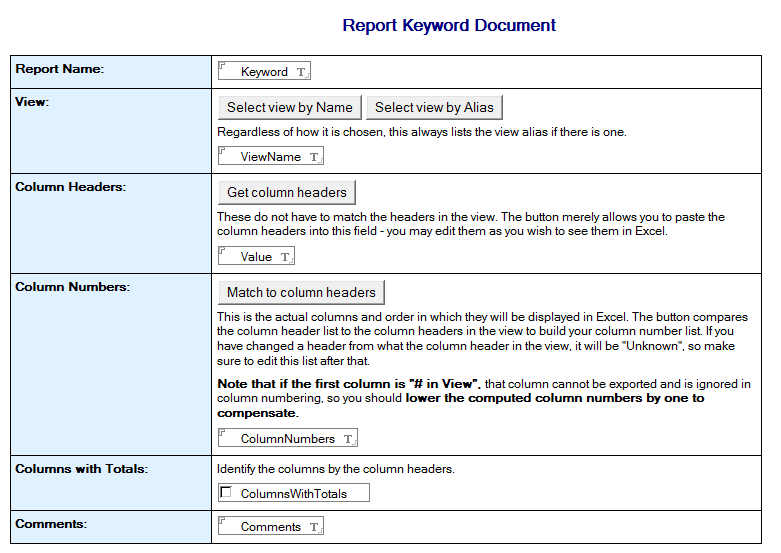 viewName: From the report configuration. View containing the documents to be exported. colLabels: From the report configuration. These will end up in the first row of the spreadsheet and be styled for emphasis. totalLabels: From the report configuration. These are used to identify which columns will get totaled. This was clearer and more reliable than using column numbers. I actually want to start by examining the last piece of code in the library, the download of the file to the client. To me, the great strength of this whole undertaking is that I can get a spreadsheet to my device without any Excel software being loaded there. As I noted yesterday, when I used the XPage and this script library to create a spreadsheet on my tablet, the usefulness skyrocketed in the estimation of my office-mate, Ariwan. “You could download the inventory to a tablet, walk around, making notes on your tablet and then return and update the database.” Of course, I started thinking one step further and wanting to import the marked up spreadsheet right back into the database, but that code will have to wait for a while. Nonetheless, we see an immediate impact beyond just creating spreadsheets. By using the OutputStream, we’re able to take the export that we build in the workbook, wb, and simply prompt the user to download the file as an output stream. On my tablet, this downloaded the file without prompting, which was exactly what I wanted. In a quick test, I tried to use .xlsx, but it refused to work – that might be fixed in the later releases of the POI library (I’m using 3.6 currently, though 3.9 has already been released). As I mentioned yesterday, we deal with a lot of international date formats and, in any reporting, dates are all over the place. So, I added a date format to be applied to those cells. Similarly, as mentioned above, I want my headers to get some styling to emphasize them. I’ve also designated my numeric format, using two digits after the decimal. Note that if the user has their machine set to use European number formatting, with periods separating thousands and a comma to show the decimal, the export won’t care – it passes the values and the user’s local settings display it according to their preferences. I’m not certain if the preferences at the server (if any) would have any effect on how you must code it, so am curious what experience others have there. I’m sure that if we delve into the POI documentation, we can learn all kinds of ways to format the cells and I expect that once this deploys, we’ll be working on learning those. We start, however, with just these three. The next important issue is that when passing the data through, you must make sure the Excel file understands the data type. reportValue = "Value not found"
Everything else in here should be pretty self-explanatory. We simply walk through the view, almost using LotusScript, moving from document to document, getting the appropriate field values and passing them to the Excel file. When it works, it’s lovely. //the view to create the detail rows. //  Terminate the request processing lifecycle. The sample database is available, as is the first post on this topic.